Mujeres Latinas en Acción celebrates 40 years of empowering women. Forty years ago, a group of courageous women in the Pilsen community decided to tackle the arising challenges affecting women, particularly Latina women. These young activists were firm believers in social equality. So much so, even against adversity, the group of women merged their resources to create what is now the most prominent organization in the nation, Mujeres Latinas en Acción. 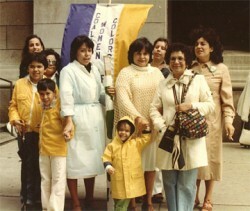 Pesqueira referred to the beginning phases of Mujeres Latinas en Acción, when it was solely operated by volunteers in the first two years and often battled politics, personal threats, and lack of funds. “These women saw the bigger picture. They knew an organization like Mujeres was needed because the issues of Latina women, the voices of Latina women were not part of the mainstream dialogue in 70s Chicago,” said Pesqueira. “So they did whatever they could to survive as a legitimate, rising organization.” Part of that included holding ‘rent parties’ in a little storefront that housed its programs. In 1975, Mujeres Latinas en Acción received its first formal funding and from there the mission of Mujeres immensely grew to currently serve over 8,000 community residents annually. The current framework for how Mujeres functions as an organization can be attributed to its own history of empowering women in disenfranchised communities. From a single program circled around domestic violence to a multitude of services that range from after-school programs for youth and teens, to a court advocacy for survivors of domestic violence and sexual assault, Mujeres has solidified itself as a symbol of hope for thousands of women. “I can honestly say, with my whole heart, if it wasn’t for Mujeres, I don’t think I would be here, alive,” said Francise Velez, who cites Mujeres as her symbol of guiding light. A mother of two, Velez sought out Mujeres after experiencing habitual sexual and physical abuse that began when she was just an adolescent. “Growing up in a family that didn’t enforce trust or safety, I had horrible experiences of my mother’s boyfriends sexually harassing me. It went on for years. I had no one to turn to. My own mother didn’t want to hear it,” said Velez. From a very young age, Velez internalized her feelings and developed low self-esteem in the process. Much of Velez’s teenage and adult years were spent enduring physical abuse from her boyfriends. Although Mujeres is primarily known for addressing domestic violence issues among women, the organization also advocates for issues in immigration, education, and leadership. “We want each individual to walk out of our doors with a sense of self-worth, dignity, and leadership skills,” said Pesqueira. “We want women to know they can make a difference in their communities.” Among the women who can attest to that is Pilsen resident Maria Gonzalez, who completed the Mujeres’ Latina Leadership Program, a program designed to identify strengths and build self-esteem. Through its many years of advocacy and working with a plethora of partners nationwide, Pesqueira is looking forward to reaching more women in the years to come. “We want each person to know that Mujeres Latinas en Acción is their home, their refuge, a place where they can feel a sense of community and know that whatever their circumstance we will go through it together,” said Pesqueira. To honor and celebrate the legacy of Mujeres 40 years in existence, the organization kicked-off its “40 for 40” campaign calling upon 1,000 supporters to donate $40 to help reach their goal of $40,000 by March 22, 2013, the day of their Annual Benefit dinner. If you would like to make a donation to Mujeres Latinas en Acción, you may send a check to Mujeres Latinas en Acción, 2124 W. 21st Place, Chicago, IL 60608. If you would like to learn more about Mujeres’ services, visit them at www.mujereslatinasenaccion.org.